Rachel Maddow the failed MSNBC Reporter becomes the laughing stock of the net over Donald Trump’s tax return that shows Trump made a lot of money, and paid more Tax than Bernie Sanders. 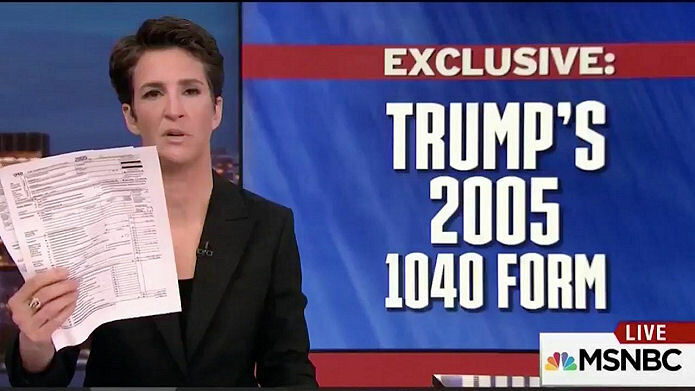 MSNBC’s Rachel Maddow released President Trump’s 2005 tax returns in the biggest over-hyped epic fail in Television history. BREAKING: We’ve got Trump tax returns. Tonight, 9pm ET. MSNBC. You know you are desperate for ratings when you are willing to violate the law to push a story about two pages of tax returns from over a decade ago. Before being elected President, Mr. Trump was one of the most successful businessmen in the world with a responsibility to his company, his family and his employees to pay no more tax than legally required. That being said, Mr. Trump paid $38 million dollars even after taking into account large scale depreciation for construction, on an income of more than $150 million dollars, as well as paying tens of millions of dollars in other taxes such as sales and excise taxes and employment taxes and this illegally published return proves just that. Despite this substantial income figure and tax paid, it is totally illegal to steal and publish tax returns. The dishonest media can continue to make this part of their agenda, while the President will focus on his, which includes tax reform that will benefit all Americans. This MSNBC Stunt topped Geraldo Rivera’s Mystery Of Al Capone’s Vault broadcast live on nationwide TV, back in 1986. What, if anything, is in the vault of notorious Chicago gangster Al Capone? Buried beneath the Lexington Hotel, the country watched as Geraldo Rivera found out. Live on location with a demolition crew, and using exclusive details, Rivera starts with taking down the outer wall. The full episode video is here.